Outside after Friday, the 20th Appellate Court argument: Center background in suit and blue shirt Hank Gutman member of the defendant Brooklyn Bridge Park Corporation, Center in trench coat Otis Pratt Pearsall who sought protection for views from the Promenade, foreground in red tie Steven Guterman who started plaintiff Save The View Now organization to object to view-blocking Pierhouse hotel/residential complex being oversized. 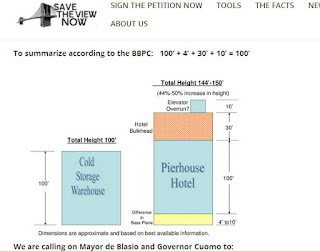 Friday, the 20th, there was an Appellate Court argument on Monroe Place about whether the already mostly constructed “bulky Pierhouse hotel/residential complex in Brooklyn Bridge Park” should be reduced in size because it is 30 feet taller than the view plane height limit negotiated with the community in 2005. Technically, the hearing was about whether the community group Save The View Now was within the statute of limitations when it brought its lawsuit. 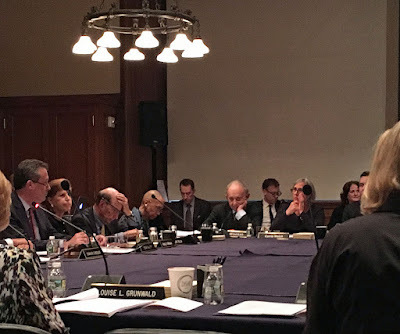 In bigger picture terms, the discussion and questions being asked by the judges involved who knew what when in terms of protecting the community from the encroachment that now blocks the iconic view of the Brooklyn Bridge the public previously enjoyed when visiting the Brooklyn Heights Promenade. 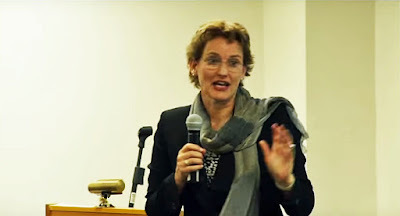 It was explained to the court by a lawyer defending the development and the quasi-governmental Brooklyn Bridge Park Corporation that oversaw it that there were decisions to alter the building by putting additional (view-blocking) mechanical equipment on top of it because of Hurricane Sandy, which hit New York City as Superstorm Sandy October 29, 2012. When after that was it that, the Brooklyn Bridge Park Corporation made the decision and was the building’s taller height ever made official with any sort of publicly released and available approval document? That did not appear clear from any response to the judge’s questions. And, presuming something like that actually happened, when it was incumbent upon members of the public to notice that the assured height limit negotiated in 2005 was being cast aside so that the public needed to take action to protect itself. 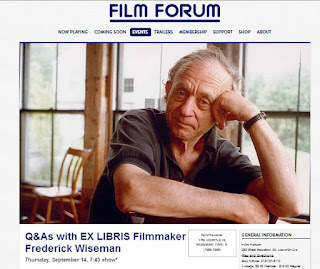 • Mr. Gutman is on the board of the Brooklyn Bridge Park Corporation, which, with him there, has been promoting maximum development within the “park” for some time now. • Mr. Gutman was also on the board of the Brooklyn Heights Association (having also been an officer there too) until the beginning of 2011 when he resigned in protest over a lawsuit the neighborhood brought against improper development in Brooklyn Bridge Park. 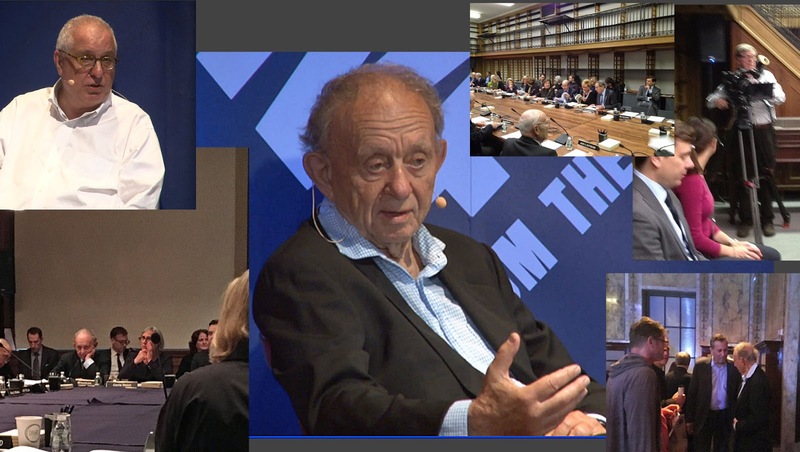 • Lastly, Mr. Gutman (along with a fellow BBPC trustee also involved in pushing library sales, David Offensend) was one of the first to buy condos in the extra-tall Pierhouse building that was the subject of the litigation. In theory, any applicable law was interpreted such that the trustees’ purchase of apartments was not considered a breach of ethics. 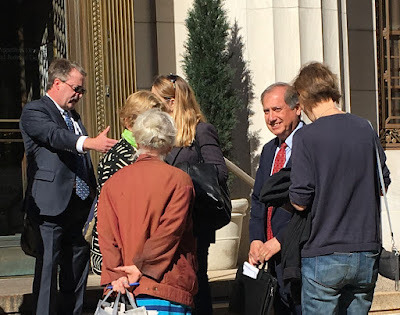 What was interesting to watch about Mr. Gutman was the way he was nodding his head affirmatively to help communicate to the court that everyone knew that the building was going to be extra tall, so much taller than originally expected. `Did the community know?’ Gutman nodded his head. 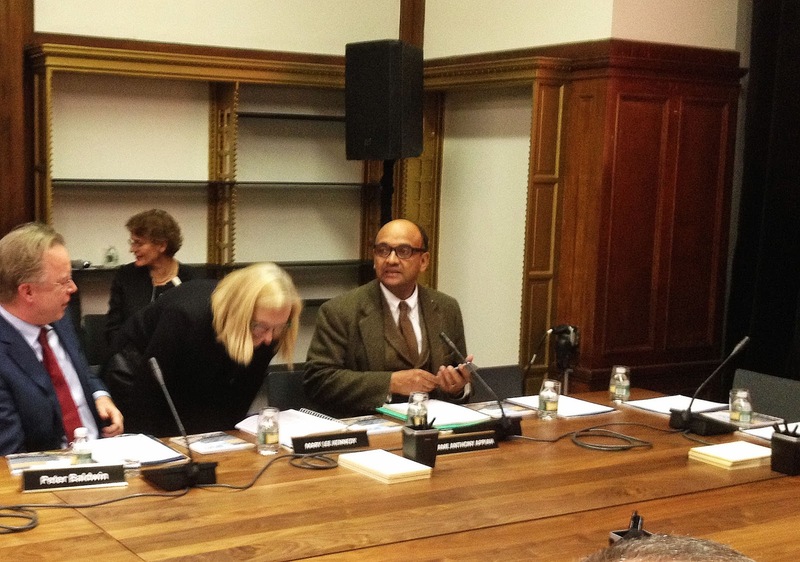 `The Brooklyn Heights Association knew?’: This was when the fellow in the chair immediately in front of Gutman swiveled around happily excited to confer with the nodding Gutman. That man looked like a lawyer; you know, the briefcase, the suit, the haircut, etc. Gutman is a lawyer too. Nodding Mr. Gutman was first out of the court house. The nodding, or subtle gestures to hopefully communicate with the court, is typical and permitted courtroom decorum. Members of the audience are not supposed to actually talk or be disruptive, but, like a public hearing, you sort of hope that maybe you’ll have a lot of people on your side of the case in the court room and that subtle facial expressions during the arguments will get picked up upon. . . . Then there is the subject of chuckling (sometimes absurdities will provoke that reaction in you if you don’t want to actually cry): The United States Justice Department is prosecuting a woman who chuckled during a United States Senate hearing when it was asserted that the record of racial discrimination by Attorney General nominee Jeff Sessions was a “clear and well-documented” record of “treating all Americans equally under the law.” Senator Elizabeth Warren was silenced and kicked out of the Senate Chamber for attempting to introduce facts that would have set the record on this straight. 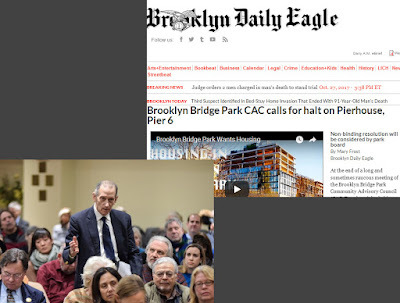 Brooklyn Eagle coverage of the CAC vote meeting attended by a public very upset about the oversized development. At the meeting the Brooklyn Bridge Park Corporation representatives provided their explanation of how the building had become so extra tall. What I remember asking myself and listening carefully for at that meeting was what the Brooklyn Bridge Park Corporation board knew and approved. That’s the BBPC board that Mr. Gutman is on. It seemed to me that violating the agreed upon view protections, something so important to the community, something giving so much extra benefit to the developer in terms of extra building rights, was something that the BBPC board should have approved. . . What did the BBPC board know and when? - It would seem that in a rational world the board should have had to debate and formally approve it. I didn’t hear anything about that. When you are dealing with height, height should be a very easy thing to understand, but when you are dealing with a building’s it’s more complicated to understand, which involves a question of where are you measuring from and where are you measuring to? One of the questions I like to bring up on that is with respect to One Freedom Tower and, is it the tallest building in America or not. Do you count the spire as height? There are a lot of questions. . . .[the public audience got impatient at this point and started complaining volubly] . .
. . So we got questions from developers about where do you start counting from and where do you count to? 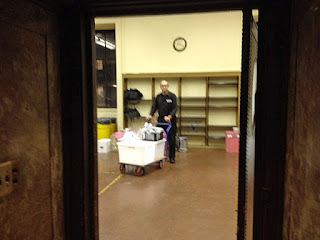 And we went to the ESDC [the Empire State Development Corporation, the nominal state authority parent of the city-controlled BBPC, an obscure quasi-governmental authority famous for having the freedom from being exempt from rules and getting to make them up instead. The exemption enjoyed by ESDC and BBPC as its nominal subsidiary includes exemption from the standards of NYC zoning and NYC’s normally applicable ULURP process for public review] A construct that ESDC uses for a lot of project plans is that whenever you have project plan those project plans are specific, and then you have a design attached to them. The general plan you have for Brooklyn Bridge Park, as you saw, is actually very general, and people have had problems with people asking questions that are not covered in the general project plan. And what they have done in order to deal with that discrepancy is that in those cases they would defer to the local zoning plan [from which they are exempt]. The project plan does not actually say what the hundred feet is or where you measure it to. Let’s look at how the New York City zoning code answers those two questions, and then the New York City zoning code there is a height restriction and there are lots of ways to calculate . . Thereafter when Superstorm Sandy happened, the BBPC representative said things got even worse for the community in terms of the building’s extra height. The representative explained, floodplain elevations were changed to raise the building up higher “and that changed all the math that was involved.” That extra elevation for the starting point at the bottom of the building was additional to the other changes blamed on Sandy at the court hearing about moving view-blocking mechanicals to the roof to make it taller at its top. Naomi Klein warns us about “disaster capitalism”: When disasters strike, the monied interests take advantage of those disasters in self-serving ways. The Sandy related changes that made the building still bigger were, according to the ESDC representative, being made until September 2013. If construction of the building started in summer of 2013 as was stated at the court hearing, that would mean that Sandy related design changes were being made even after construction started. At the hearing it was discussed that people in the community were first beginning to notice that the building was getting too tall in September 2014. The plaintiff organization Save the View Now was formed because of this in December of 2014. 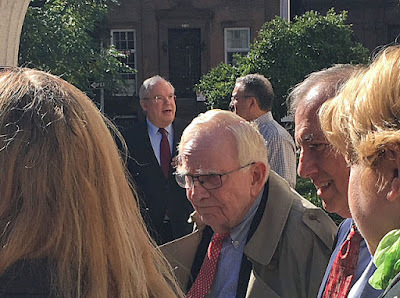 Mr. Gutman’s nodding of his head doesn’t necessarily indicate anything beyond that fact that he wanted the court to rule that the community knew and that Brooklyn Heights Association knew about the extra large size of the building at times early enough to cause the statute of limitation impediments the team of development supporting attorneys were arguing should defeat the case. It doesn’t necessarily mean that Mr. Gutman (a BBPC board member), or the BBPC board knew at these or these (or other even earlier) times of the building’s extra large size. (Rather than it being just the BBPC staff engaging in technical interpretation somersaults). But it makes me wonder and sort of gives me that feeling that this was pretty much the case. . . .
. . . And if that is so, I have to ask: Brooklyn Bridge Park Corporation is a governmental entity endowed with enormous governmental power- Doesn’t it thereby stand to reason that it owes a responsibility to the public to be absolutely clear, and should clearly alert the public when it is not planning to honor an agreement about protecting an important identified and agreed to public interest? Is the BBPC entitled to play cat and mouse games about what it is doing? Notwithstanding Mr. Gutman’s head nodding, it was not until very late in the game that public really figured out or knew what was going on. 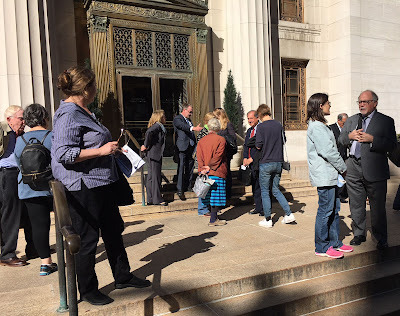 At the hearing the development defending attorneys argued that the community reacted to the size of the building with “Rip Van Winkle” tardiness. It was asserted that community had “inquiry” notice, “constructive” notice, and “actual” notice of the bigger building and the mechanicals “above the roof of the building.” Leave it to lawyers to come up with assertions involving such parsed out multiplicities. There was no assertion of “information gotten by pulling teeth” notice, “cat and mouse game triumph” notice, or “able to decipher technological gobbledygook” notice. I also heard no direct explanation of what notice the Community Advisory Committee, the BBPC’s “ the “primary vehicle for communicating with the public,” got when it believes it got no notice and that instead the BBPC “dribbled out” information in a way that was deliberately intended to be uninformative. It was even hinted that maybe notice letting the public know didn’t even matter: A development lawyer made the dodgy assertion that the “view was improved” by the project. It was affirmatively asserted there was no stealth or concealment on the part of BBPC. Respecting the Brooklyn Heights Association the argument was particularly interesting. The lawyers defending the development’s size argued that by virtue of a December 2011* letter from BHA President Jane McGroarty that referred to an acceptable height for the building that was “exclusive of mechanical equipment” the record showed that Brooklyn Heights Association, the “the dominant civic organization” of a community of what was “not a bashful community,” had notice and was aware and was not objecting to the ultimate height of the building. Really? Is that a good argument? December 2011 was nearly a year before Superstorm Sandy and the cascade of rejiggering alterations with all the “math” involved changing (concluding September 2013) that, among other things, put an unexpected and atypical amount of extra stuff on the building’s roof making it taller. There is other stuff we could brawl about here like what people are referring to the “bulkheads” being permitted on top building. If you think you know buildings “bulkheads” might sound relatively innocuous and if you Google images of “bulkheads” for examples, the small slant-roofed minimalist protrusions you’ll see are not likely to suggest to you what has been constructed atop this building under the “bulkhead” rubric. . including, as Tony Manheim put it, “a bar and café” ? 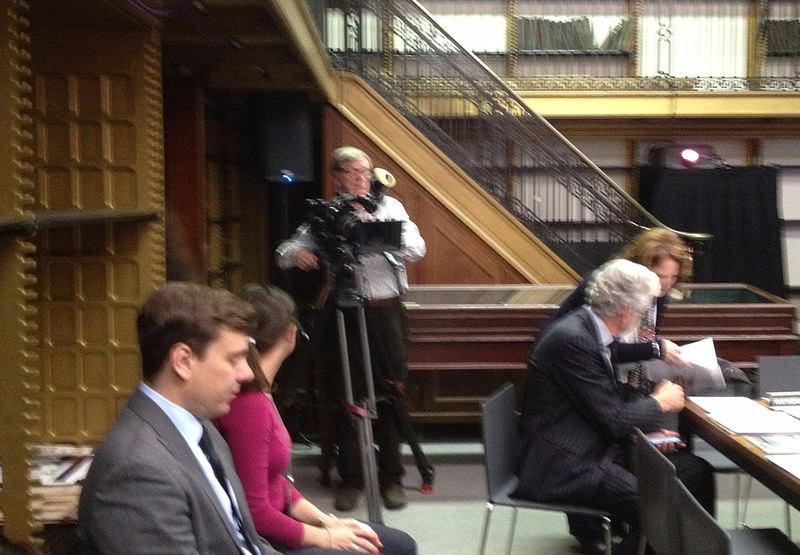 Crowd lingers to analyze after the hearing. Plaintiff attorney Jeff Baker on highest steps. 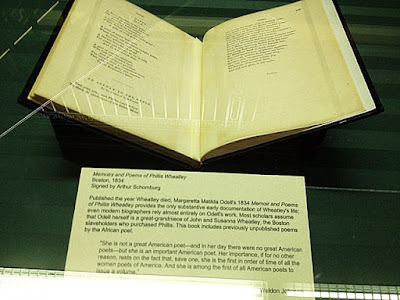 This article is not intended to parse the exact legal arguments that forayed into the field at the Friday appellate court hearing, nor analyze the relative strength of the arguments and why certain arguments should perhaps logically prevail. This musing over the situation is more for the purpose of giving a general feel for what is happening and the overall context in which it is taking place. 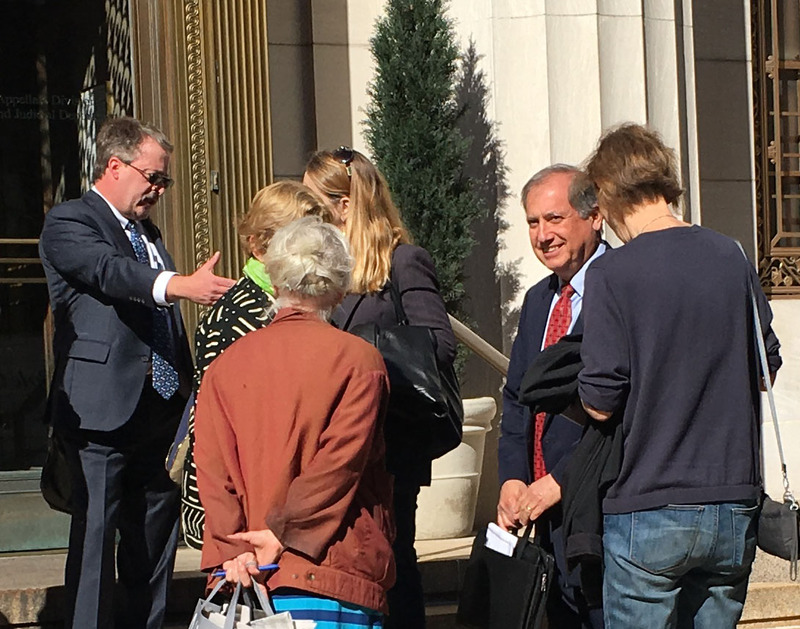 Closer up: Plaintiff attorney Jeff Baker on steps, Steve Guterman in red tie. Will the appellate judges issue an order that could result in 30 feet being removed from the top of the unexpectedly tall view-blocking building? People find that outcome startling to imagine, but it is absolutely within the judges' power to do so, although situations of this type presenting precedent are rare. And, as counsel for the plaintiffs told the court, the defendants knowingly proceeded to build at their own risk. The judges by their tone and skepticism seemed to at least consider that the community was likely treated badly. But when do judges these days ever decide against the money? One thing we might expect is something we have seen before in these situations: An opinion that scolds the BBPC and public development officials (including its board? 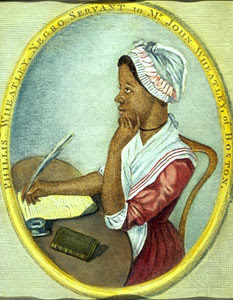 ), but then protects the monied interests from lose of their ill gotten gains despite such a judicial upbraiding. 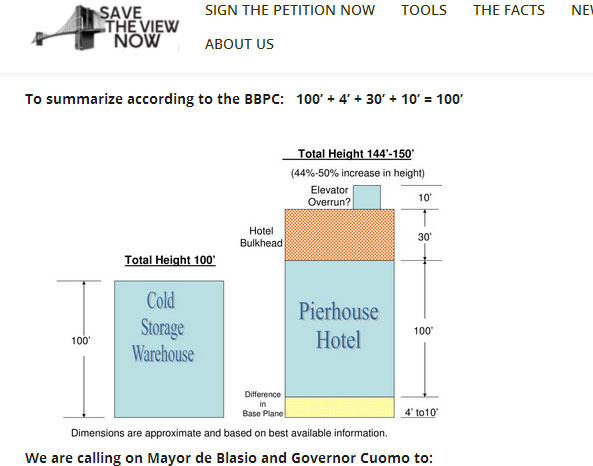 This was in the first posting of Save The View Now December 31, 2015 to alert the community about the building's height. Manhattan District Attorney Cyrus Vance Scandals: Jared Kushner and Ivanka Trump- One! Harvey Weinstein- Two! 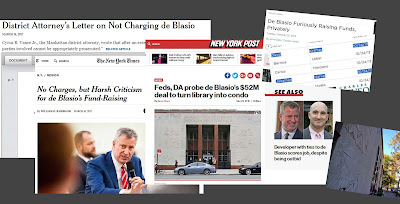 Bill de Blasio Library Pay-To-Play Scandal- Three? If you have been catching up with the news recently you know about the scandals involving Manhattan District Attorney Cyrus Vance. . .
Vance's office was ready in 2012 to prosecute Ivanka, the daughter of Donald Trump and her husband Jared Kushner for real estate fraud, “allegedly duping prospective buyers in a failed Manhattan project dubbed Trump Soho” (a violation of the Martin Act). Reportedly, against his staff's recommendations (and despite some damn good email evidence), Vance did not prosecute. His receipt of campaign contributions was involved. . . Now under the spotlight, Vance just gave back money, a $31,000 donation from Father (Donald) Trump's lawyer, Marc Kasowitz, he took in 2013 after dropping the case. Another $9,000 from employees at Kasowitz’s law firm and $9,000 more raised at a breakfast hosted by Kasowitz was not returned. Then there is the case of movie production mogul Harvey Weinstein whom a slew of women have now accused of sexual assault and harassment. Vance made a decision not to prosecute Weinstein in 2015. His decision not to prosecute was despite an very damning police sting audio tape that documented his harassment of an Filipina-Italian model Ambra Battilana Gutierrez in a Manhattan hotel. Again, Vance's receipt of campaign contributions was involved. . . 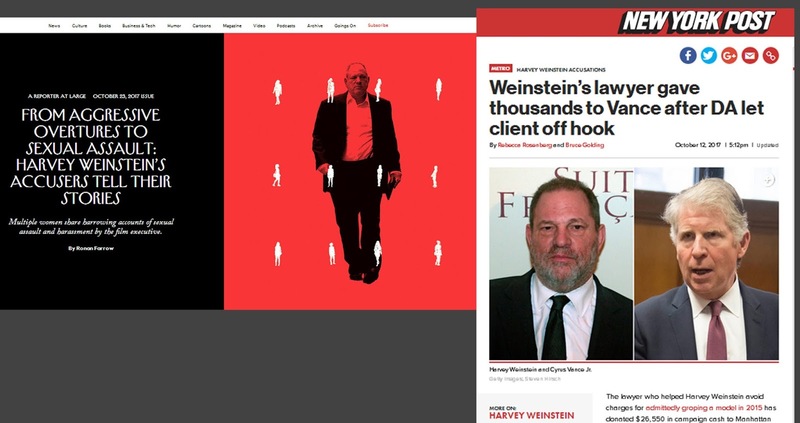 The lawyer, Elkan Abramowitz, who helped Harvey Weinstein avoid charges (Vance's former law partner) reportedly donated $26,550 in campaign cash to Manhattan District Attorney Cyrus Vance Jr. (including $2,100 after Vance let Weinstein walk) plus, according to campaign finance records, his law firm gave Vance another $11,500, before Vance's Weinstein decision. That failure to prosecute is scandal number two! The media is beginning to notice and connect the two because of the similar behaviors on Vance's part. 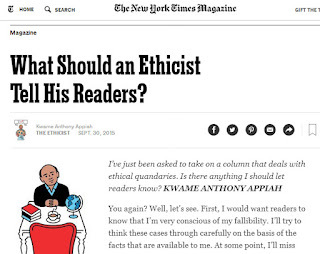 The New York Times editorial board issued an editorial saying: "that eyebrows understandably soar skyward when a district attorney pockets cash from a lawyer who may have a client facing charges that could send that client to Attica.. . . As lawyers might say, res ipsa loquitur. The thing speaks for itself."
. 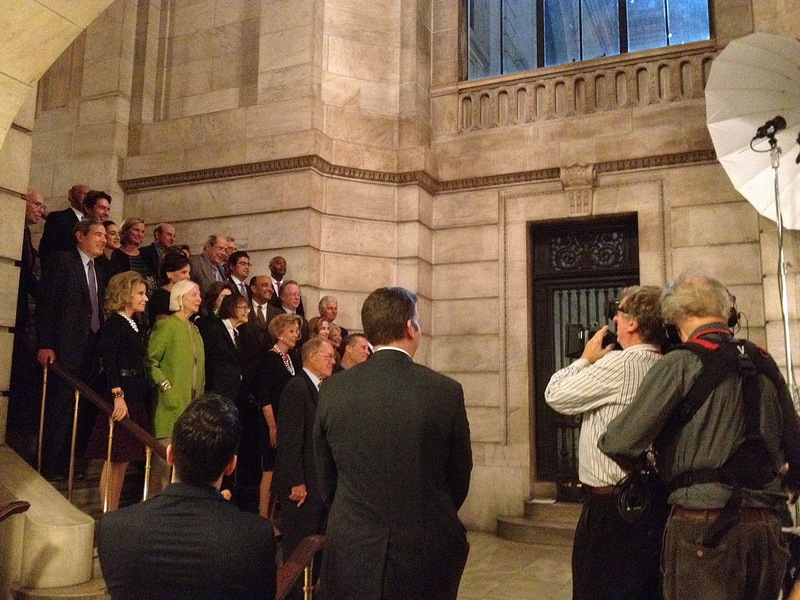 . . Now you might remember that until recently Cyrus Vance was working with US. Attorney Preet Bharara to investigate pay-to-play deals by Mayor Bill de Blasio. 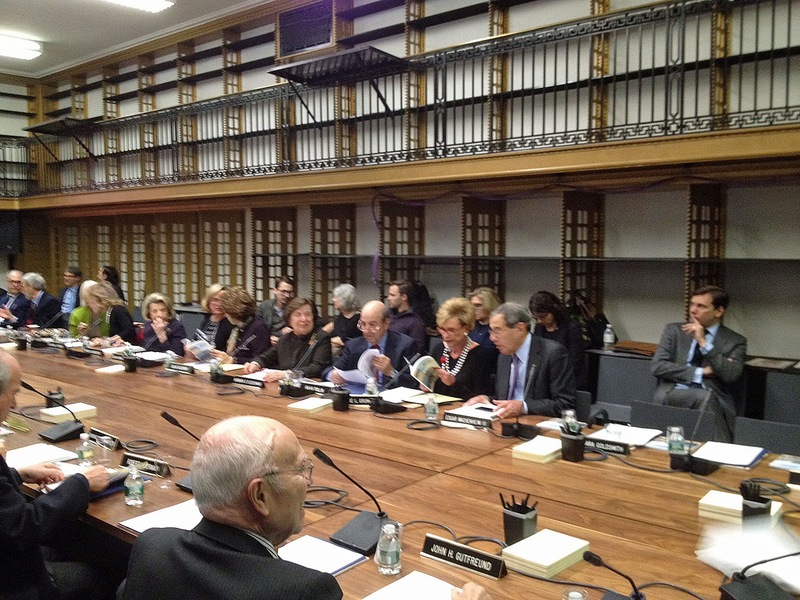 And you may remember that one of those pay-to-play deals was the sale of the Brooklyn Heights Library. Then Donald Trump fired Preet (March 11, 2013) and just a few days later (March 16, 2013) all these investigations were dropped. . . And? We'd love to know more about what was involved. Preet Bharara has since lifted the curtain to say that he believes that before he Trump fired him Trump was trying to “cultivate” a relationship with him where he'd be asked by Trump to do the wrong thing. 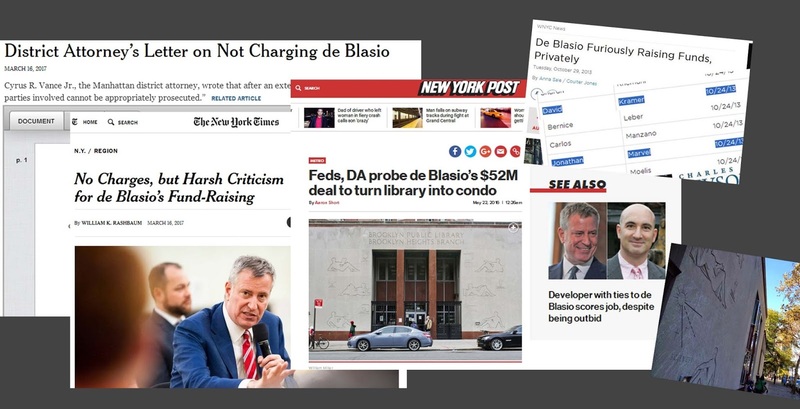 How hard do you think it would be to trace aspects of the Brooklyn Heights Library and other pay-to-play deals being investigated back to campaign contributions to Vance from those close to de Blasio or Democratic party operatives or involved developers wanting de Blasio's real estate favoring reign to continue undisturbed? : The Times editorial noted that the list of Vance's donor's "is strewn with law firms and individual lawyers" some of whom "may have unsavory motives when they open their wallets." But we don't even have to get to that kind of extensive cross-checking to bring us full circle to the Vance contributions we have already discussed. We need only note that the Brooklyn Heights shrink-and-sink-a-public-library scheme replicated the previously executed Donnell shrink-and-sink-a-library and replace it with a luxury tower scheme. That Donnell deal also involved a woefully lacking excuse for a valid "bid." For both deals there was a significant overlap of people involved behind the scenes. And, if you could have flipped people to get them talking, the trail led back to Trump son-in-law Jared Kushner as a principal financial beneficiary from the sale of Donnell . .
. . . It's probably not exactly what Trump supposedly had in mind when trying to "cultivate" a relationship with Bharara unless you want to think generally in terms of privilege exercised by a well-connected elite prone to take advantage of the commoners. It's been suggested that an excuse for Vance's decision not to prosecute is that it is waste of his office's resources to prosecute the powerful who can fight back and bollix up prosecutions by hiring expensive lawyers and pay for 14 carat obfuscatory PR maneuvers regular folk can't afford. (Similar to the Weinstein case, in 2011, Vance abandoned a sexual-assault case against Dominique Strauss-Kahn, the former managing director of the International Monetary Fund.). . .
. . . On the other hand, shouldn't our first priority be to prosecute the powerful whose conduct entrenches corruption at the core of our system and warps our most important institutions? 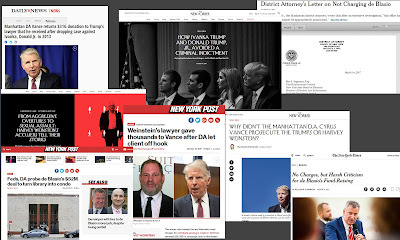 Coincidentally or not, The New Yorker magazine got the ball rolling with major stories it respectively ran about both the Kushner/Ivanaka Trump and Weinstein failures to prosecute. . .
. . . We could hope that another New Yorker story might get the ball rolling on a third such story about the non-prosecution of de Blasio. Maybe not: David Remnick, the New Yorker's editor is a trustee of the New York Public Library and investigating the Donnell Library sale or anything leading back to it would be unconformable for the NYPL trustees (and perhaps particularly Trump buddy Stephen Schwarzman). Or we could hope that another prosecutor with power and authority, most obviously New York State Attorney General Eric Schniederman, could pick up the scent . . . 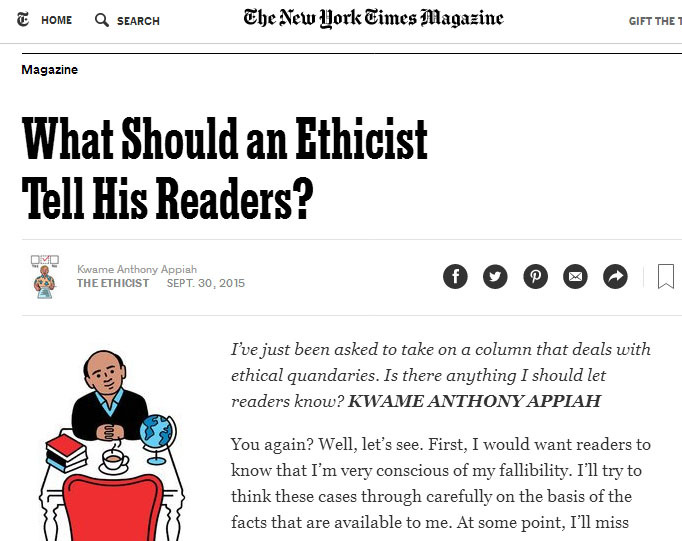 But maybe not: It has been noted that Schneiderman also takes political donations from those he could or should be investigating- How was it that the Times editorial put it about eyebrows understandably soaring skyward when a prosecutor pockets cash from a lawyer who may have a client facing charges that could send that client to Attica? Vance is running for office unopposed in the November 7th election.